Preparing aspiring professionals with clearly written, in-depth scientific coverage of food and its safe preparation. Never before has food received so much attention. Today's news shines a spotlight on food, food science, and nutrition — beckoning today’s readers to an exciting career in this essential industry. 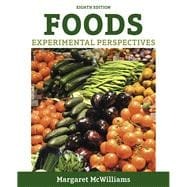 Foods: Experimental Perspectives, Eighth Edition blends the underlying science with discussion of GMOs, sustainability, healthy and trendy food choices, and other current consumer issues. Its clear presentation of the science guides readers through complex concepts that influence practices in food preparation and product development. The study of foods begins with an in-depth presentation of carbohydrates and food sources, followed by a careful look at lipids, and ultimately proteins and their principal sources. Aspects of the food supply, including safety, preservation, and additives are then examined. Discussion of the research process and evaluation techniques used in food research and product development close the text. Professional vocabulary is developed through margin definitions and a substantial glossary, while other learning aids — chapter objectives, summaries, study questions, "Food for Thought" boxes, and photos — support the reader's journey through the exciting look at food, food science, and food safety. Margaret McWilliams, Ph.D., RDN, is Professor Emerita at California State University–Los Angeles. There, she taught food science and served as Department Chair and Program Director of the Coordinated Dietetics Program, which she co-founded. Dr. McWilliams earned her B.S. and M.S. degrees at Iowa State University and her Ph.D. at Oregon State University. She belongs to many professional organizations, including the Institute of Food Technologists and the Academy of Nutrition and Dietetics. Her current texts include: Food Around the World: A Cultural Perspective, Fourth Edition, 2014 (Prentice Hall); Experimental Foods Laboratory Manual, Eighth Edition, 2008 (Prentice Hall); Food Fundamentals, Tenth Edition, 2012 (Prentice Hall); Illustrated Guide to Food Preparation, Eleventh Edition, 2012 (Prentice Hall); and Fundamentals of Meal Management, 2005 (Prentice Hall).